Not only did I pre-order the book (it came yesterday) I had a chance to talk with Brian and record a video interview about the premise of the book, the problems it can help people solve, lessons for marketers and a fun game of word association. You can watch the video here and part of the text of the interview is transcribed below. Lee: What’s the fundamental premise of Lifescale and why did you write it? Brian: Yeah, well it’s not the book I set out to write to be honest with you. I was writing a book to follow on X: The Experience When Business Meets Design and I had these ideas of trying to create a more mainstream book. This is my 8th book, but it’s my first personal book. I wanted to switch from the world of business to a more mainstream world. That brought a lot of pressure to think differently, to think deeply, to be more creative than I had in the past. I just got stuck. I blamed it on writer’s block and on all kinds of different things, just being uninspired, unmotivated and too busy. Actually I was really disappointed and heartbroken because I ended up losing the opportunity for that book at the time. After I had time to reflect, I started to dig deeper and peel back layers to see what was really going on. It turns out I was suffering from the same distractions from the same technologies I had been covering for the past 10, 12, 14 years. I decided to get to the heart of the matter and understand what’s really going on here behind the tech, what’s it doing to me as an individual. Obviously, if it’s affecting my ability to go deeper and affecting my creativity, what else is it doing? I felt like that whole mission could be something to share with everyone. Because it surely wasn’t out there on Google. There are a lot of solutions for the symptoms but not a lot of solutions for the problem. To be honest, a lot of the problems are still being discovered. Lee: It’s important that you mention problems because there are a lot problems that Lifescale might be able to solve or facilitate the solution of. What are some of the key promises that Lifescale can deliver on. Brian: It’s funny, I remember talking to Shannon over at Wiley and she said, “Whatever you do, don’t make a book about problems. Don’t make a book about tech, or all of the things that it is doing to us. Write a book about solutions because that’s what people really need.” I was 100% with her but I didn’t know what the solutions were because they didn’t really exist. So, after many glasses of champagne and thoughtful exploration, I realized that what we had been missing is a guidebook for a modern life. If you think about it, a lot of how we work or learn, our standards for success, our routines every single day, the traditions and aspirations that were handed down to us by our parents and their parents sort of really starting to become outmoded in these modern times. At the same time, there is no real guiding light to tell us how to balance all of these things. We’re sort of being exposed to more information, more misinformation, we’re empowered where we’re becoming accidentally narcissistic where we’re reaching for these things because it makes us feel in the moment validated or important. Lifescale is really about is scaling life in modern times. Giving us a guidebook to reimagine or rethink or reacquaint ourselves with what is important. All of these things are intoxicating but they’re also very new. They didn’t come with an instruction manual. We didn’t really have parents, or mentors or teachers or managers to guide us and navigate us through all of these things. We’re all trying to figure it out. What Lifescale is really about is scaling life in modern times. Giving us a guidebook to reimagine or rethink or reacquaint ourselves with what is important. What does happiness look like? What does success really look like? It really has nothing to do with tech per se, but uses tech as the impetus to have these discussions because we’re all, in one way or another, feeling that anxiety or that stress or that pressure. Lee: While this book’s appeal and application is broad, what are the applications of Lifescale for a marketer? Brian: It’s twofold: One, there’s the life of the marketer. They’re using a lot of these technologies in their personal life that they’re also using professionally. They’re applying how they using technology personally to how they use it professionally. They’re assuming people on the other side want to be engaged in the way that they’re using technology through the funnel. On the customer side of things, or the receiving side of things, whether that’s an employee or a partner, you’re essentially trying to reach people who are incredibly distracted whether they know it or not. They have their own intent every single day of what they’re trying to do online, whether that’s to celebrate their life online, share exactly what they’re doing, engage the community to move something forward, figure out how to make a decision on a purchase or an investment or what to do regarding something. There’s this intentionality that’s happening every single day. A lot of times we use these same technologies to try to disrupt it. It’s not new. Advertising and marketing has always been about disruption. Can I get your attention, can I hold it for a second, and then can we trend for a minute, then move on. But, I think it also opens the door to a new generation of marketing that I call the age of assistance. People are intentional about what they’re trying to do online. They are distracted but they are also empowered, informed and connected, so how would you plug-in to that to add value? This is an opportunity for marketing to become the entire journey, so that customer experience becomes the new marketing. Every single day they’re leaving signals on what they want to do or what’s important to them. There’s ways to introduce things not just to sell or interrupt whatever it is that they’re doing but to find ways to build value so that the brand or the marketing becomes associated with value add. So you’re building brands based on empathy and emotions rather than interruption and attention. Lee: So we’re not interrupting people anymore but facilitating them to do what they want to do. Brian: I’m not saying stop doing all that you’re doing today, but I am thinking that this is an opportunity for marketing to become the entire journey, so that customer experience becomes the new marketing. You’re thinking about that journey and that lifecycle and adding value throughout and that makes marketing that much more important. Lee: There are many themes in the book so let’s play a game of word association. I’ll mention a word and you share what it means in the context of Lifescale. Productivity – Not just getting work done, it is about getting the right work done to the right output. Mindfulness – Being present in the moment to which anything or anyone around you recognizes that you’re in that moment with them and that there’s value exchanged. Personal Growth – Accepting that no matter how much you feel you have conquered or grown in life today that there is always something new to learn and something old to un-learn. Lifehacks – They often treat the symptoms but not change your life. What if you could hack your center of reference so that when you make decisions about what you have to do that you have hacked them to be relevant, pertinent and fruitful. Hustle – Just because you work all the time, doesn’t mean that it matters to everybody. It doesn’t necessarily mean that it’s the right work to be doing. Life is balanced with other things other than work. If your work is the thing that is actually all that’s consuming you, then I feel sorry for the people that are around you. Creativity – It has never been more important. We live in an era of machine learning, artificial intelligence and more technologies on the horizon. Automation is going to become wildly pervasive. That creativity, how you think, what you do, how you act, what you produce, your output, your work ethic, your imagination that goes into anything – all of those things stand out. We don’t need filters to be great. We don’t need animated gifs to get that point across. What we need to do is take a moment to be creative, to imagineer what someone else couldn’t see or do. Leadership – There’s a lot of management and there’s a lot of following the rules and a lot of following the paths that were laid out before us. But a lot of those are rooted in the analog era. When we talk about leadership we have to think about what does it mean to forge a new path for a new time. That’s what I hope Lifescale is about – producing a new breed of leader. Personal Development – We always have something new to learn every single day. I always say that my occupation is that of a student. Things move too fast. There’s always someone smarter, there’s always someone more creative. The more that we challenge or push ourselves, even in a fun way, developing what we do personally and professionally is only going to keep us more relevant and I think, happier. Distraction is holding you back from greatness and the possibilities that could define your life. Distraction – The average person looks at their phone about 1,500 times a week which adds up to about 177 minutes a day. If you added that up over time and think about all the different things you could do, like learn a new language, learn how to scuba dive, anything that you wanted to do that you didn’t do or that you’ve been putting off or making excuses not to do, distraction is holding you back in ways that you haven’t realized. Distraction is holding you back from greatness and possibility that would define your life. If you ask the universe, the universe will give to you – nothing is going to happen if you don’t know what it is that you’re working towards and if you don’t work towards it. Lee: Lifescale is essentially a worldview, it’s like a movement. What does success look like for you? Brian: There are a lot of people who have made movements out of their work. For example, Simon Sinek with Why and Tim Ferris with the 4 Hour Work Week. I don’t know that I have it in me alone to do that. What I’ve decided to do is make Lifescale a universal movement to give it to the community. I have great friends like Dennis Yu and Karen Freberg who are helping me turn this into a Lifescale coaching program. We have a certification program for people to go through the Lifescale process so they in turn can extend and teach all of their network so that I’m not holding back Lifescale but everybody can bring the Lifescale message and movement and help all of us break free from distractions and be more creative again. Thanks Brian! 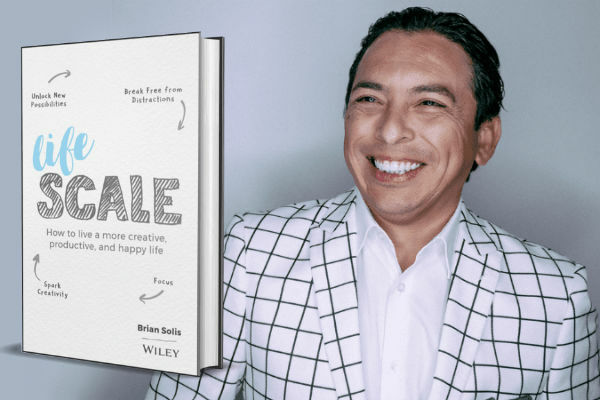 You can find Brian next speaking at SXSW and Social Media Marketing World and follow him on Twitter at @briansolis. Of course you can find out more about Lifescale on the website.